So we’ve been building towards the big DESK REVEAL – but in reality, it’s so much more than just a desk, but a complete, clean-lined, compact office solution. A place where we can get down to business if we need, that provides the storage for-two requested but also avoids closing in the space. We shared in our last post how an old roll of contact paper allowed us to recapture beautiful, natural light while maintaining privacy from the front of our apartment building. We refinished an old media cart with chalk paint to have a handy place to stow our printer and other neat storage boxes, without losing valuable real estate on the desk surface. 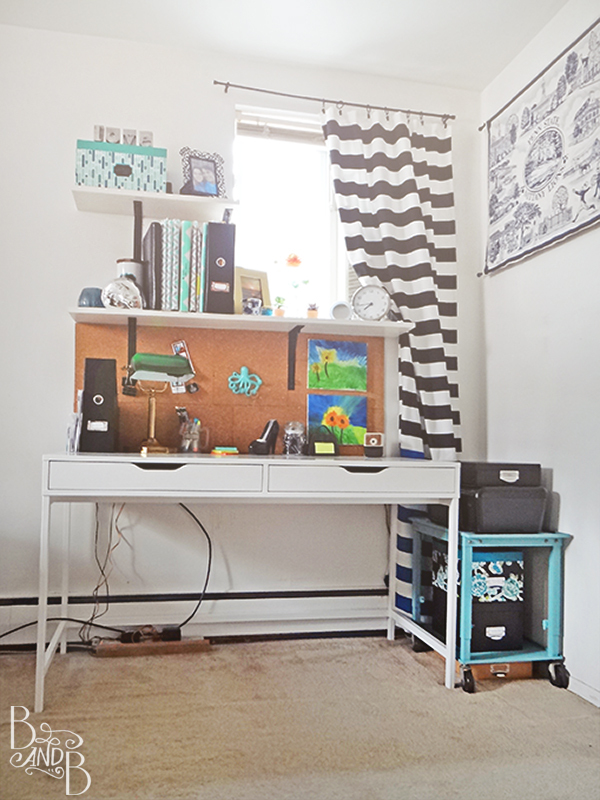 This added a great pop of color to balance the clean white of the desk. The desk was to be placed beneath the window, with the center of the desk lined up with the left edge of the window as this is a tight corner in the room. 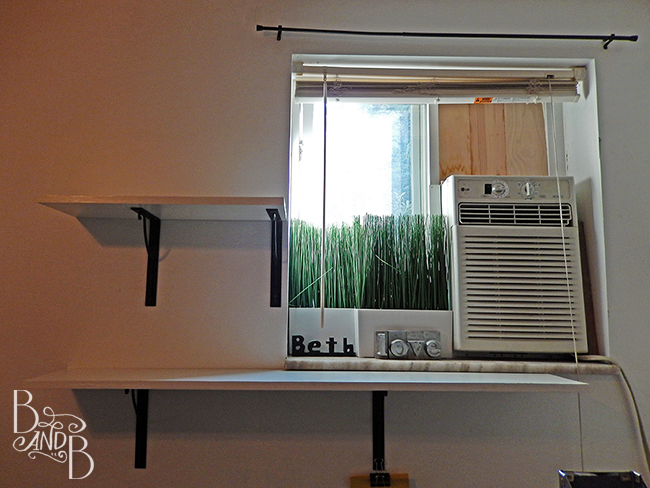 This off-centered idea was balanced by framing the window with shelving equal to the width of the desk. 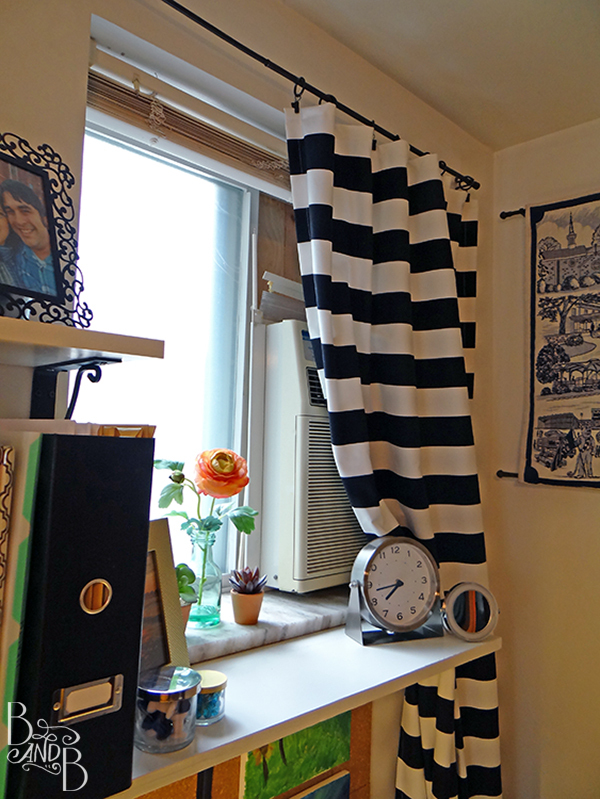 To balance the higher second-shelf, and to also help hide the air conditioner in the window, a bold striped curtain was added that can be draped in-front of the unit in the winter (decreasing cold drafts) and pushed aside in the summer. 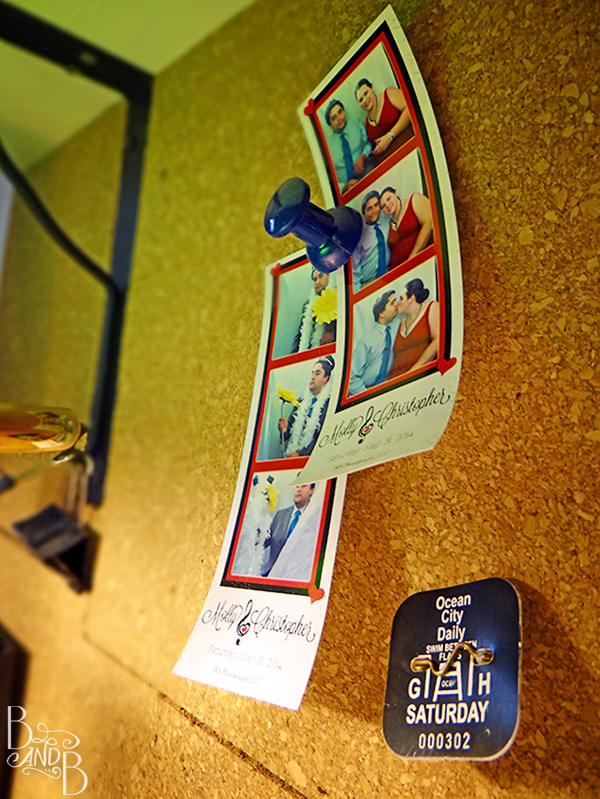 Beneath the shelves, above the desk surface became the hub of the desk. But with renter’s-white walls that we couldn’t change, and a white desk with white shelves — things were starting to look a bit cold. So we decided to add some cork tiles to the wall to warm the space up with a natural texture. The tiles were easy to install with double-sided mounting squares included, and a few extra command strips for good measure. Now we got to start dressing up the desk! You see we have most of the usual desk accouterments, but a few pieces were re-used from other sources, or were just too fun not to include. 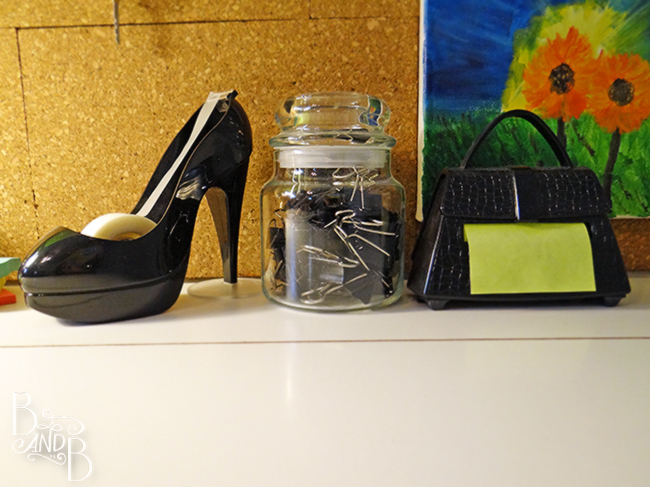 I finally have a place for the Shoe tape dispenser and Purse Post-it holder my sister gave me! And yes, that’s an recycled Yankee candle jar holding binder clips. Above, we finally found a place to hang some of our own hand-painted artwork. We created these last year at the Pittsburgh Home Show. Not bad for free art! And the colors in the art relate to the green in the banker’s lamp and other points on the desk. 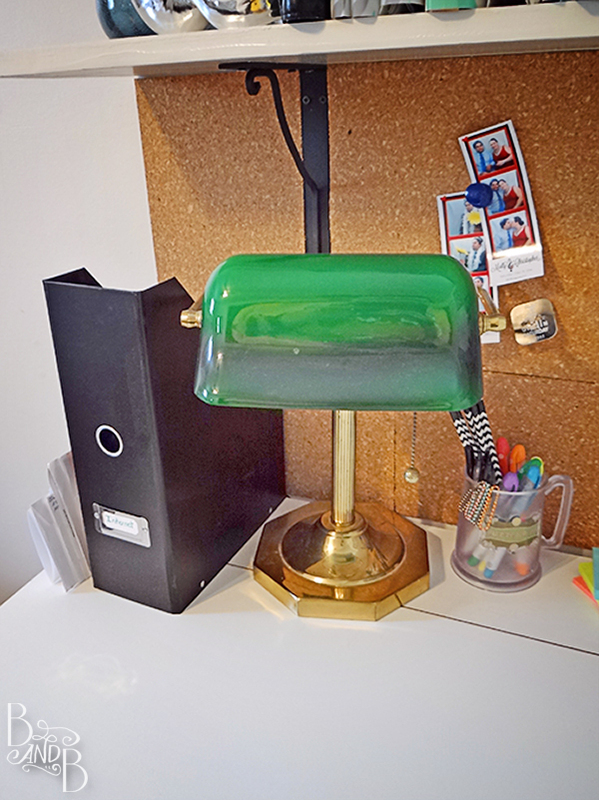 This Banker’s lamp was actually one of the few things Bill had in his apartment when we met! I love the gold which kinda plays off the warmth of the cork behind it. Plus, it works! Shop your own stash, right? Plus next to the lamp we keep our stealthily-hidden internet router. Speaking of Shopping your own stash, I finally found a place for my Harry Potter World Butter Beer mug! After cruising with my friend, Heather, I learned the beauty of simple souvenirs. But when the Butter Beer comes WITH the mug, you gotta keep it, right? Now it makes the perfect, quirky pencil cup for our desk. 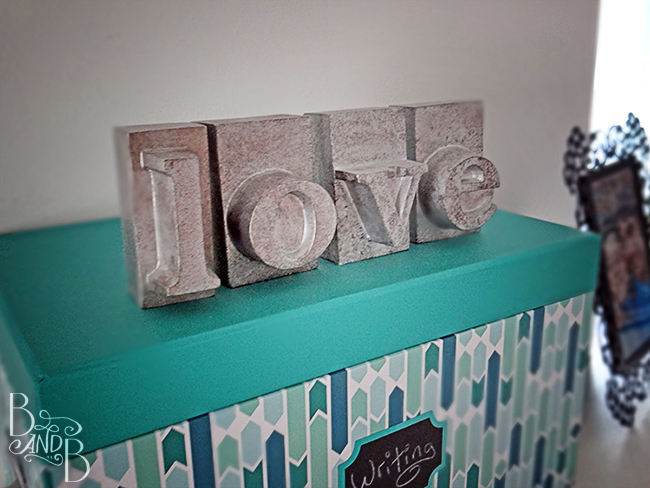 And Octo-Love finally has a home! I picked this guy up at Target when Young House Love first released their hardware line, and he sat there in his box for an embarrassingly long time. But now he’s useful! And here, a little more recycled storage. We often come in and pin something onto the cork quickly, so keeping the pins out in a container we can see through, and at eye level on the shelf, makes it a quicker process. And a handy To-Be-Filed spot. So we can stash documents that need to be filed away and batch-sort them later. This fishy was intended to be a napkin holder. Works just as well here! All-in-all I think we ended up with a great space that we ‘love’!